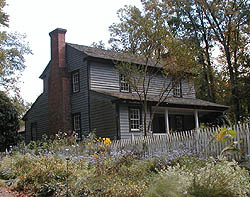 The Tullie Smith House is a typical early Georgia plantation house, the form and details of which are known as the "plantation plain" style. The Smith House contains many characteristic architectural features of this type including weatherboard siding, simple gable roof, masonry chimney, and interior walls sheathed with matching boarding, simple window trim and doors. The house was built c. 1840 by Robert Smith, who migrated from Rutherford County, North Carolina, by 1830 and settled in DeKalb County, Georgia. Smith was a yeoman farmer who owned 11 slaves and cultivated approximately 200 of his 800 acres of land, while his cattle and hogs ranged freely nearby. Yeoman farms, such as the Smith's, were more common in Georgia than the large plantations many people associate with the Deep South. Smith's great-great-granddaughter, Tullie, was the last member of the family to occupy the property. The two-story house has an attached rear section with a shed roof. The front facade was altered on the first floor level around 1885 when the original front porch was replaced by a full-length shed porch and "traveler's room." The original first floor plan was altered c. 1875, but it has been restored. There are two front rooms with a steep stair that rises from the right front room, and two smaller rooms under a shed roof addition to the rear of the house. The second floor has two rooms. There are three original mantels, two in the front rooms on the first floor, and one in the left room on the second floor. The original detached kitchen is directly behind the house--one large chimney composed of stone and brick is still used for cooking. By the late 1960s, Atlanta's highways and executive park developments mushroomed around this house, located on a hill, until it was isolated. Heirs offered to donate the house and kitchen outbuilding to the Atlanta Historical Society (now the Atlanta History Center), and an Atlanta banker provided the money needed for their relocation in 1969 and restoration in the early 1970s. The Tullie Smith House is a rare example of the plantation plain style that has been restored and operated for educational purposes. The Tullie Smith House is located at 130 West Paces Ferry Rd. in NW Atlanta. It is owned and maintained by the Atlanta History Center. Costumed interpreters lead 30-minute tours of the house from 11:15am (1:15pm on Sundays) until 4:15pm; there is a fee for admission. Call 404-814-4000 or visit their website for more information.